Welcome to El Camino de Las Cabras Goat Dairy - We are an Artisan goat cheese dairy located on 125 acres along Pecan Creek in south Tom Green County, Texas. El Camino de las Cabras is an all-natural goat dairy, creating some of the best goat cheese, milk, and soap around. Our goats eat only whole grains, sunflower seeds, and alfalfa hay, in addition to pasture grazing. No Chemicals are used in or around our barns and property. Only the freshest 100% goat milk goes into our products. We love and treat our goats like no other dairy around. They are not just livestock to us! 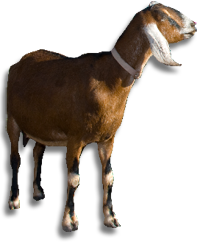 Every one of our goats are named, and valued for the delicious milk they provide.